Beer is soooo out. We’ve been detailing wine all Football Week, and now even cocktails are encroaching! Check out this one from SKYY vodka. I don’t know what it has to do with football other than the name, but I love cocktails with herbs in them – basil, thyme, tarragon. They provide such a good balance to a usually-sweet drink. 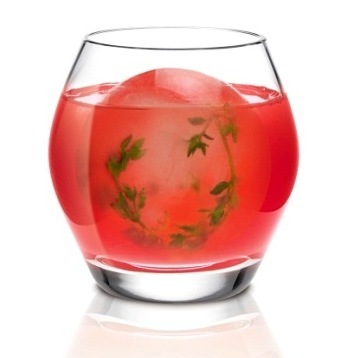 In a cocktail shaker, muddle thyme and watermelon. Add the rest of the ingredients. Shake and finely strain over ice in a rocks glass. Garnish with a thyme sprig. Tags: cocktail, cocktails, food & drink, football, thyme, vodka. Bookmark the permalink. The word play in your title intrigued me, and then I saw the image – it alone makes this one worth trying. Thanks for sharing the recipe!